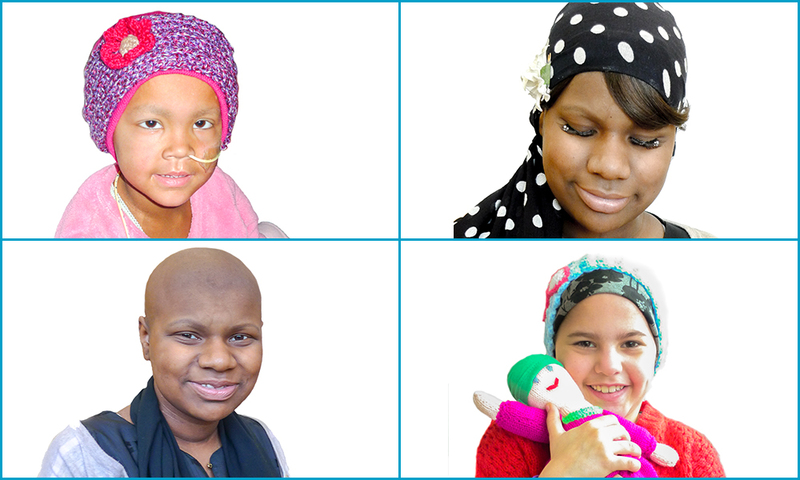 If you are a *young person, parent or health care professional who would like FREE hats, scarves, booklets, services and other items please contact a member of the Cancer Hair Care children's support team on 01438 311322. You can also Contact us by email, write to or speak to one of our Hair Loss Specialists. Young people under 18 please ask your parent or guardian for permission to call. At Cancer Hair Care we are delighted to have developed our unique FREE “Happy Heads” and “Gigs & Wigs” charity services to help children and young people with hair loss due to cancer treatments. We deliver several complex services including bedside visits to our teenage and young patients in hospitals. Our Cancer Hair Care Specialists and Advisors have developed a unique approach that deals with the psychological and physical needs of our young patients as they face hair loss. Our Cancer Hair Care Advisors and Specialists are expertly trained to listen and support you children and teenagers and offer guidance to parents/carers. Our services are delivered in an age and stage appropriate way that helps your child to understand hair loss and take control with bespoke hats, scarves and other items. Our Hair Loss Advisors all have in-hospital clinical and hands on experience of supporting children during every aspect of their hair loss experience. As well as offering services at hospitals such as UCLH, Royal Marsden, Teenage Cancer Trust Units and workshops throughout the UK we can offer FREE parcels of specialist support items such as hats, scarves, fringes, lashes and other unique items. FREE Specialist dollies - our knitted topsy turvy dolly helps children to understand hair loss through play. The dolly has hair on one side and no hair on the other. Each dolly comes complete with little hats and scarves for children to play with. Dollies are available in multiple skin colours. Each dolly is health and safety checked. Contact Us to order your FREE dolly. out reach parcels full of bespoke specialist hair loss items are delivered to suit the individual needs of each child and can be sent to children to unwell to attend sessions. FREE Guidance and support for parents - how do I tell my 5 year old girl that she will lose her first curls? How can I advise my teenager about going back to school without hair? We offer FREE support and guidance. We provide free booklets and play packs for children. Working together with the Teenage Charity Trust we have given away hundreds of FREE hats, scarves and caring in-hospital bed side services. We work at UCLH Hospital London and The Royal Marsden. To book a session in your hospital please contact our team.